Good Monday afternoon to you! Hope this day finds all well with you, and that you are staying cool. That's a tough order to fill in our neck of the woods today. The outdoor thermometer read 108.3 degrees a few minutes ago. I guess you could say it's as hot as a fire cracker, so that's what I'm going to share with you today. This card was made for the Sweet Stop Sketch Challenge #09, which was a sketch with a twist, and the twist was to use red, white, and blue. Click on the link in my left sidebar and jump over there to upload your submission and play along. 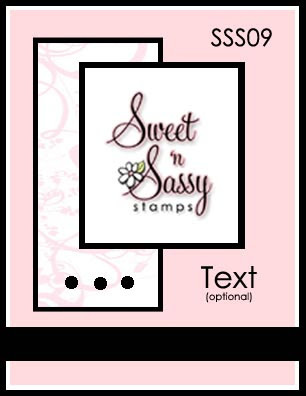 The image for this card is the newest digital release from Sweet -n Sassy Stamps. Korin came up with this fabulous digi just in time for those Independence Day cards. I think I will use this one for my Sisterhood of the Traveling Cards Swap. Lady Catherine is our hostess this month, and paying homage to our country, as well as those who are bravely serving our country is her theme for this month. A perfect choice, I thought, and bless Korin, because this digi arrived in my email box just as I was stressing because I have NO patriotic stamps. She saved the day for me!! I will say that the rest of this card I struggled with. We are fresh out of any patriotic paper in our area, so I made my own with what I could find that was rustic, as well as red and white. I sponged the edges of everything with Tim Holtz distress ink in vintage photo. The sparks from the bottom of the rocket have glitter on them, but it doesn't show up well in the picture. I'm thrilled you could stop by today. Please come back soon! Wow! This is a outstanding card!!! I love the rustic look!!! send some of that heat here....67 degrees and raining! This is a great card, and love the sentiment. I love the Vintage Americana feel of this card. You have got to teach me how watercolor! I want one I want one! What a great card and perfect match for the layout! Patriotic and perfect!